The Oregon Extension offers a fall semester of accredited college studies for the student who wants a more down-to-earth, honest, lively and deeply engaged learning experience in an intentional community setting. 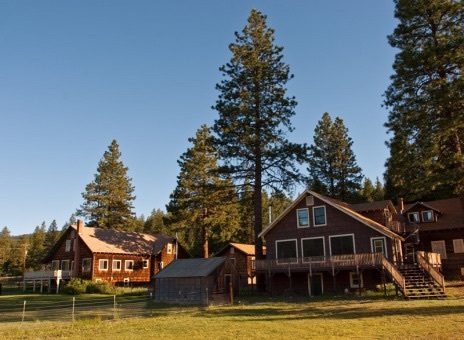 The Oregon Extension (OE) is located in a mountain hideaway in the southern Oregon Cascades and invites students to live a simplified life in a rustic forest setting as they deepen their love of learning and seek a more integrated vision of life in which all things can be understood in their relations to God. This is a unique alternative semester for Christian college students and other honest seekers. The OE semester is divided into four three-and-a-half week segments or courses. Each course is taught one at a time. The overarching interdisciplinary themes for each segment are "What is Nature," "What is Community," "What is a Sustainable World," and "What does it Mean to be Human." Over the course of the semester students will leave campus both for single-day excursions as well as multi-day excursions. These excursions will include attending plays at the Ashland Shakespeare Festival, overnight camping to Lava Bed National Monument, a six-day backpacking trip in the Cascades or Sierras, a three-day trip to the Oregon Coast, and a four-day trip to San Francisco. The OE application should only be completed after being informed from the director of study abroad that you are accepted for an off-campus study semester. Students are housed in cabins (built in 1929 to house families of local mill workers) with three other students. The cabins are basic, but do have electricity, hot water, a kitchen and a wood stove for heating. Students will have the opportunity to shop, eat and clean up after meals, and join faculty in chores such as cutting and chopping firewood.